“We’ve learned and struggled for a few years here figuring out how to make a decent phone,” he said. “PC guys are not going to just figure this out. They’re not going to just walk in.” What if Steve Jobs’ company did bring an iPod phone to market? Well, it would probably use WiFi technology and could be distributed through the Apple stores and not the carriers like Verizon or Cingular, Colligan theorized. I was reminded of this quote after Amazon announced an agreement to buy Whole Foods for $13.7 billion; after all, it was only two years ago that Whole Foods founder and CEO John Mackey predicted that groceries would be Amazon’s Waterloo. And while Colligan’s prediction was far worse — Apple simply left Palm in the dust, unable to compete — it is Mackey who has to call Amazon founder and CEO Jeff Bezos, the Napoleon of this little morality play, boss. The similarities go deeper, though: both Colligan and Mackey made the same analytical mistakes: they mis-understood their opponent’s goals, strategies, and tactics. This is particularly easy to grok in the case of Colligan and the iPhone: Apple’s goal was not to build a phone but to build an even more personal computer; their strategy was not to add on functionality to a phone but to reduce the phone to an app; and their tactics were not to duplicate the carriers but to leverage their connection with customers to gain concessions from them. Mackey’s misunderstanding was more subtle, and more profound: while the iPhone may be the most successful product of all time, Amazon and Jeff Bezos have their sights set on being the most dominant company of all time. Start there, and this purchase makes all kinds of sense. “Anything they might want to buy online” was pretty broad; the advent of Amazon Web Services a few years later showed it wasn’t broad enough, and a few years ago Amazon reduced its stated goal to just that first clause: We seek to be Earth’s most customer-centric company. There are no more bounds, and I don’t think that is an accident. As I put it on a podcast a few months ago, Amazon’s goal is to take a cut of all economic activity. This, then, is the mistake Mackey made: while he rightly understood that Amazon was going to do everything possible to win in groceries — the category accounts for about 20% of consumer spending — he presumed that the effort would be limited to e-commerce. E-commerce, though, is a tactic; indeed, when it comes to Amazon’s current approach, it doesn’t even rise to strategy. 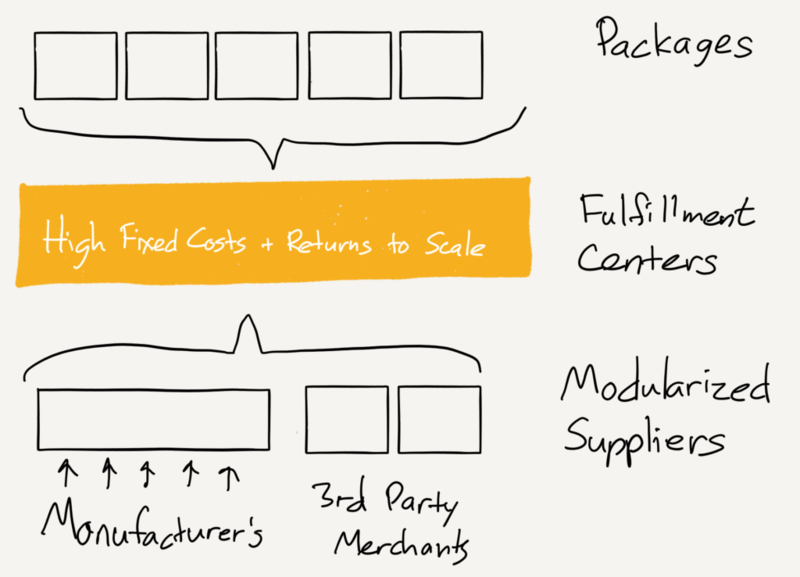 As Mackey surely understood, this meant that AmazonFresh was at a cost disadvantage to physical grocers as well: in order to be competitive AmazonFresh needed to stock a lot of perishable items; however, as long as AmazonFresh was not operating at meaningful scale a huge number of those perishable items would spoil. And, given the inherent local nature of groceries, scale needed to be achieved not on a national basis but a city one. Groceries is a fundamentally different problem that needs a fundamentally different solution; what is so brilliant about this deal, though, is that it solves the problem in a fundamentally Amazonian way. This last point was a win-win: developers would have access to enterprise-level computing resources with zero up-front investment; Amazon, meanwhile, would get that much more scale for a set of products for which they would be the first and best customer. As I noted in that piece, you can see the outline of similar efforts in logistics: Amazon is building out a delivery network with itself as the first-and-best customer; in the long run it seems obvious said logistics services will be exposed as a platform. 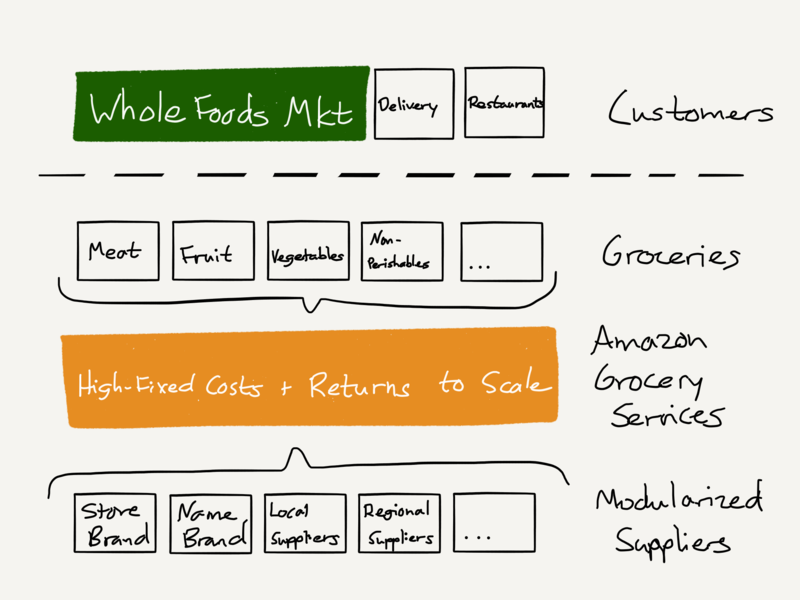 This is the key to understanding the purchase of Whole Foods: from the outside it may seem that Amazon is buying a retailer. The truth, though, is that Amazon is buying a customer — the first-and-best customer that will instantly bring its grocery efforts to scale. In the long run, physical grocery stores will be only one of Amazon Grocery Services’ customers: obviously a home delivery service will be another, and it will be far more efficient than a company like Instacart trying to layer on top of Whole Foods’ current integrated model. I suspect Amazon’s ambitions stretch further, though: Amazon Grocery Services will be well-placed to start supplying restaurants too, gaining Amazon access to another big cut of economic activity. It is the AWS model, which is to say it is the Amazon model, but like AWS, the key to profitability is having a first-and-best customer able to utilize the massive investment necessary to build the service out in the first place. I said at the beginning that Mackey misunderstood Amazon’s goals, strategies, and tactics, and while that is true, the bigger error was in misunderstanding Amazon itself: unlike Whole Foods Amazon has no particular desire to be a grocer, and contrary to conventional wisdom the company is not even a retailer. 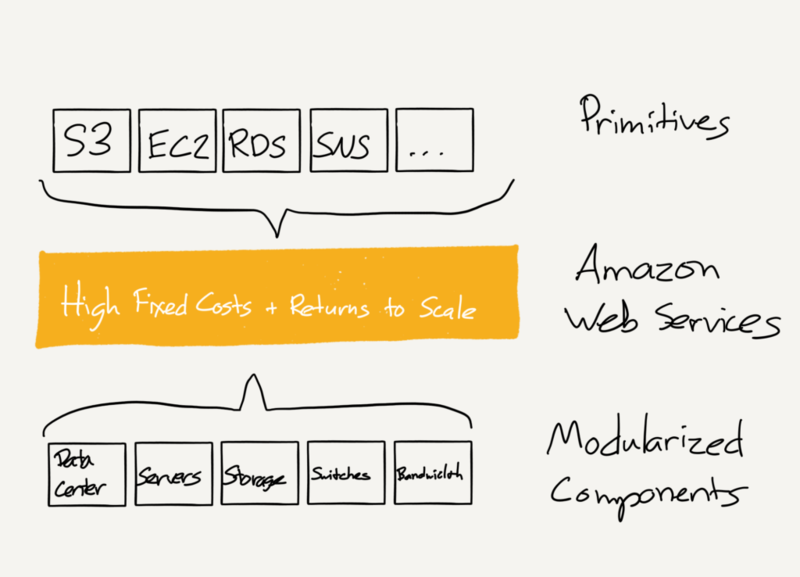 At its core Amazon is a services provider enabled — and protected — by scale. Indeed, to the extent Waterloo is a valid analogy, Amazon is much more akin to the British Empire, and there is now one less obstacle to sitting astride all aspects of the economy.